The wait is finally over! Episode 1 of the Total Gym Challenge is now up and ready to be viewed at the link above. We recently took 14 people who wanted to see if they could reach their weight loss goals and fitness goals in 14 workouts over 21 days using The Total Gym. Fitness trainer and Total Gym Pulse contributor Rosalie Brown leads the group over the next few weeks to a healthier, happier and more productive lifestyle. In this episode “The Weigh-In” we meet the participants for the first time, learn what their fitness goals are and catch their reactions as they are weighed at the start of the program. Now let’s meet the group! The first person we meet is Karen, a single mother of two who says she has come a long way on her fitness journey but is looking to take it up a notch. She has seen the Total Gym commercials with Chuck Norris and Christie Brinkley and knows that the machine gets results. She is looking forward to seeing if she can meet her goals of making her back and waist smaller and also to get rid of some stubborn fat in her midsection. Karen has a goal of getting down to around 120 pounds. Amanda is the next participant we meet weighing in at 186 pounds. Her arms and stomach were one of her main concerns at the weigh-in as she is looking to tone up. Amanda says she’s never been comfortable enough with her body to wear a tank top and would like to change that so she can enjoy wearing one this summer. In addition, she wants to be able to make it to first base without running out of breathe when she plays softball. Amanda has a weight loss goal of 15-20 pounds and hopes to get the best shape of her life with The Total Gym Challenge. Right after Amanda came Stuart. Immediately after seeing his weight he admitted that he needed to lose some weight. Stuart is a dedicated husband and father of two who says he never really has much energy these days. His main goals are to start to exercise regularly, work on his core strength, tone up and lose between 15 to 20 pounds. Jamie has some upcoming weddings she has been invited to and wants to look her best. 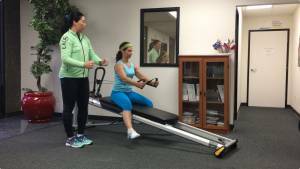 She wants to get more definition in her lower hips and abdominal regions. In the past, Jamie has primarily focused on cardio and isn’t as familiar with an effective strength training program. She hopes after the 14 workouts she is able to incorporate the routine into her regular exercise routine. With The Total Gym Challenge she hopes to get her weight down to around 128-130 pounds. Jamie was at 138.8 pounds at the time of the weigh-in. Next, we have Bruce. 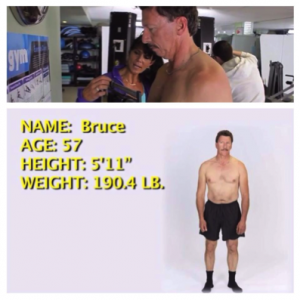 Bruce is 57 years old and wants to strengthen his core, improve his cardio endurance, increase muscle mass and improve overall tone of his body. He also wants to improve his golf swing since he is an avid golfer. Bruce is starting at a weight of 190.4 pounds and would like to get down to about 180. Following Bruce is his wife Janet who says she definitely needs to lose some weight. She also wants to tone her muscles, firm up, loose inches around her waist and lower her body fat percentage. Janet came in at 160 pounds at the weigh-in. Kirsten who is 24 years old told Rosalie that she is hoping to lose at least 10 pounds during the the Total Gym Challenge. Kirsten is a newlywed and proud new mom to a 5 month old son. Not only did she gain post pregnancy weight but her blood pressure has risen as well. With the Total Gym Challenge she is hoping to motivate herself to start losing weight, lower her blood pressure and get back on a healthy routine to enjoy life with her family. Vicki is the next participant who we meet in Episode 1. This 23 year old wants to lose 10 pounds and get in bikini body shape. In addition, Vicki wants to get in better shape, not only for the duration of The Total Gym Challenge, but for the rest of her life by following a regular exercise and diet plan. Caren is a 52 year old wife and mother of three children having very little time for herself. She would like a fitness program that is very efficient and effective without having to spend three hours in the gym. The workout she has been doing for the last 10 years simply isn’t cutting it as she has slowly gained 20 pounds. Caren told Rosalie that as people get into their 50’s they have problems in areas of their body that they never had before such as “flab” underneath the arms. In addition to these problem areas, she wants to lose weight in her stomach region and hips. Caren also hopes to get into the best shape of her life with The Total Gym Challenge. Doug is a participant who made an awesome decision for his health and stopped smoking about four years ago. The only drawback has been the 25 pounds he has gained since then. This husband and father would like to lose around 20 pounds or so and weighed in at 171 pounds. Taya told Rosalie she would like to get down to 125 pounds after 14 workouts. She weighed in at 134.2 pounds. In addition to weight loss, she would also like to gain muscle, get leaner and feel stronger and more fit. Entrepreneur, husband and father Bud says he’s found it difficult to find the time to workout with his day to day stresses of building his business. Bud would like to focus on toning up his midsection and wants to feel comfortable with his shirt off. Bud weighed in at 186 pounds and says he would like to be 10 pounds lighter. Jacky is in the healthcare industry and counsels her patients on how proper diet and exercise can turn physical ailments around. However, she finds it difficult to take her own advice when work and family obligations start to take over. She says her problem areas are her stomach and her outer hip and thighs. Jacky says she is ready to make fitness a priority. Her goals are to lose excess weight, get her energy back and find a manageable fitness program that can be incorporated into her busy schedule. Rounding out our group of 14 participants is Lisa. She is hoping to lose about 15 pounds, gain muscle and have herself bikini body ready. Lisa is 48 and weighed in at 143.8 pounds. Thank you for joining us on Episode 1 of The Total Gym Challenge! Be sure to visit Total Gym Pulse for Episode 2 “The First Workout” debuting this Thursday August 15th. To find out more about how The Total Gym can help you along in your fitness journey please visit Total Gym Direct. See you next time! Can’t wait to see their progress!